Objectives and Overview (C. Wihlborg, M. Fratianni and T.D. Willett). Implications of 1992 for Regulation, Competition and Structure of the Financial Services Industry. (Contributors: J. Kimball Dietrich, Comment: A.M. Santomero; D. Folkerts-Landau, P.M. Garber and S.R. Weisbrod, Comment: P. Englund; A.M. Santomero; G. Skogh). Investment Banking and the Industrial Sector. (Contributors: R.C. Smith and I. Walter; B. Espen Eckbo, Comment: S.R. Weisbrod; G. Eliasson, Comment: N.Chr. Nielsen). Barriers to Capital Mobility and Financial Intermediation. (Contributors: J.O. Montgomery, Comment: D. Gros; A. Giovannini; Comment: M. Melvin). Economics and Politics of the EMS. (Contributors: R. Glick and M. Hutchison, Comment: L.S. Goldberg, Comment: R.J. Sweeney; J. von Hagen and M. Fratianni, Comment: T. Gylfason; C. Wihlborg and T.D. Willett, Comment: J. Driffill). Economic Policy Perspectives on Financial Market Regulation and Supervision. (Contributors: T. Rybczynski; N. Carter; E. Ems; I.G. Doronin). Economic Policy Perspectives on Monetary Arrangments. (Contributors: Y. Oritani; S. Arndt; K.K. Lewis; T. Franzén; Sir A.A. Walters; A. Protopapadakis). The Transition to a Convertible Currency for a Centrally Planned Economy (Contributors: S. Schönberg; E.-M. Claassen; S.M. Borisov). Subject Index. 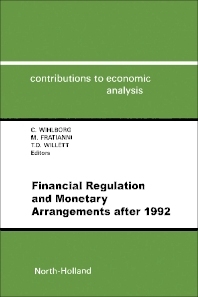 Presented in this volume are analytical papers by leading academics on the consequences of regulatory reform in the 1992-process on financial markets and institutions, as well as on macro-economic adjustment and the scope of monetary and fiscal policy after 1992. Also included are policy-oriented papers by economists in academic and policy-making authorities which discuss potential policy conflicts within the EC and between the EC, EFTA, the US, Japan and Eastern Europe as a result of financial liberalization and monetary integration following 1992. The volume focuses on developments in financial markets as crucial for financial and industrial restructuring, as well as for prospects for a monetary union. Analytical papers form the basis for broader policy oriented discussion of potential policy conflicts among industrialized countries, as well as of prospects for currency reform in the Eastern block.